We all know about being Queen for a Day. How about being Kween for Life! “Avokween” is the name on the Kween Foods Co-Founder’s Instagram account, and it speaks to both Ali Bonar’s love of avocados, and her playful, yet serious, approach to food. Ali and business partner, Eric Katz, are both California natives, Ali from San Diego and Eric from Santa Barbara. They met at the University of California Berkeley, where they were seemingly on different paths, but as paths of creative, interesting people often do, theirs converged. Finally ready to make a change, Ali not only began to practice “intuitive eating,” but she also became part of a like-minded community on Instagram. Her fun posts on Instagram documented listening to her body and relaxing the confining food codes she had been attempting to adhere to, and she discovered a group of supportive women also on the same discovery path. As she was creating recipes, eating them and shooting them for Instagram, she found herself adding nuts to a lot of smoothies and other creations. In the spirit of intuitive eating, Ali began to realize that nut-based products were hard on her digestive system and were weighing her down. 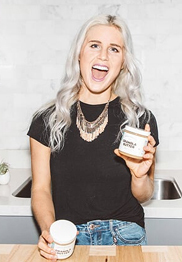 She experimented with seed butters and other non-nut butters, but though she found them easier to digest, she wasn’t “nuts” about their taste. 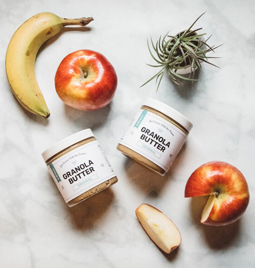 She decided to come up with her own creations, and that’s how granola butter got started. The granola she made from scratch was easier to digest, it had a great taste, and it was different from other non-nut butters on the market. Of course, Ali’s Instagram followers were the first to learn about Granola Butter. The great feedback she received got Eric thinking that there was a market for it, and they decided to launch the product, involving the community that had grown around her on Instagram. Ari Schraer is now the couple’s third partner, bringing product development skills. In addition to the Original, which is vegan, Kween Foods also offers Original with Collagen, an odorless tasteless protein, which has become a popular supplement.